When our guided reading group time was almost over, it was so simple to hand students a Post-it note (that could serve as a bookmark), tell students to finish reading a chapter, and, as an assignment, "say something" on the Post-it note that they will share the following day when the group meets again. When I first tried this response with students, I quickly figured out that giving them the above list was not enough. As a teacher, you definitely need to model what a well-written Say Something Post-it note looks like! If you don't model, you will definitely see minimal effort in the form of notes that look like the 1-star notes below. Recently I ran across this blog post by Chartchums, where they created an anchor chart that showed the progression from a 1-star Post-it note to a 4-star Post-it note for their second graders. I thought it was such a great idea that I was inspired to create a similar anchor chart for upper elementary students based on the Say Something Post-it Note reading strategy. I especially like the visual element- it is clearly and immediately evident to students that shorter responses are worth only 1-star because they lack details. In order to write a 4-star Post-it note, students must strive for higher-level thinking that includes details and thorough explanations. 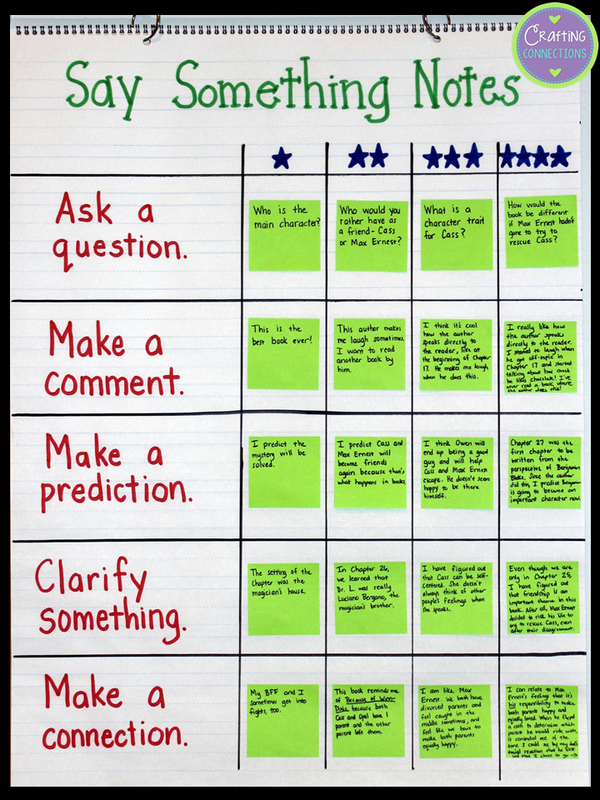 When I share this anchor chart with students in the future, I plan to show them the anchor chart on the first day, and discuss what makes each Post-it note deserve that number of stars. On the second day, after students have written their own independent Post-it note responses, I will have each student bring his or her note to the anchor chart and line it up with where they believe their Post-it note should be placed. For example, if a student wrote a prediction, I would have him look at the 4 prediction Post-it notes on the anchor chart and decide which most resembles the type of response that he wrote. After a few days of doing this, hopefully students will be writing 3- and 4- star Post-it note responses! 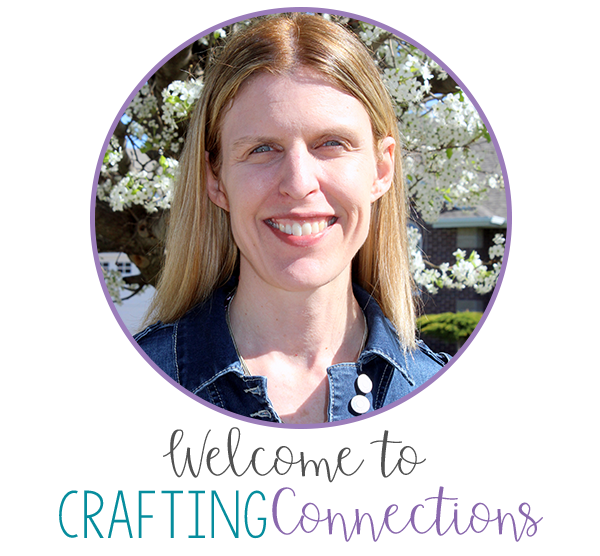 I was going to make my own Say Something bookmarks to attach to this blog post, but after doing a quick search on TpT, I found that some fabulous bookmarks already exist! Check out these freebies by Let's Geaux Teach! Do you have any tricks for getting students to write detailed responses to what they've read? I'd love to hear your ideas! This is just what I was looking for that my principal couldn't provide! Oh, what did I do before Pinterest! Thank you so much! I would love an enlarged photo as well. Thank you. I would like an enlarged photo too as I like the idea but can't read it all... minz1970@gmail.com.... thank you in advance. I would love an enlarged photo as well :) thanks-great idea! I would love an enlarged photo! Thanks so much! May I also have an enlarged photo? Thank you! Love the idea! Could I also get an enlarged photo? katelputnam@gmail.com Thank you! Great idea!! I would love an enlarged photo as well please. Would you be able to provide me with an enlarged picture...thanks! I would love an enlarged picture! I cannot wait to try this out next year! I also love the link to the bookmarks! Me, too, please!! Thank you for the link to bookmarks. Me too please!!! erikalundgarcia@gmail.com. Thank you so much! Please send me a larger photo too at mnichols@brazosportisd.net. Thank you! Would you please send me an enlarged photo too? Thanks so much! I would like a larger photo as well! Thank you so much! I would also love an enlarged photo, if possible! Thank you!! Hello! Yes, I am happy to send anyone who requests a photo the largest photo I have of my anchor chart. Thank you so much for visiting my blog and my Facebook page! Have a great day! Hello Deb. I just accepted a third grade teaching position and would love an enlarged photo of the Say Something anchor chart. It looks like you are helping many teachers. My email is wynndj@roadrunner.com and my first name is Dianne. Thanks! Hi Deb. I just accepted a third grade teaching position and would love an enlarged photo of the Say Something anchor chart. It looks like you are helping many teachers. You can reach me at wynndj@roadrunner.com. Thanks! Thanks! I'd love an enlarged copy! I'd love to see the photo enlarged. Sorry to join the queue...but I could please have an enlarge photo too? Thanks heaps. I too would love an enlarged copy please! Can I have an enlarged photo of the anchor chart as well? My email is kh422711@gmail.com. Also, for the "Say Something" bookmarks, for step 1, are the students sharing their post it with someone?